All of the rumors the last few weeks indicated that Apple would keep a lower cost 9.7″ device in the lineup, so the “new” iPad that was released wasn’t a surprise. It also wasn’t a shock that this “announcement” was little more than an update to Apple’s online store and a few comments to key press outlets. However, despite the absence of fanfare, this new device is a unique departure from the norm for Apple. They gave the iPad a processor bump and a brighter screen, but also made it closer to the size of the original iPad Air and removed the screen lamination and outer coating. Also, while the rumors of the new iPad coming in at $299 were a little off, Apple did manage to get the price down to $329 in this feature trade-off. The combo of adding size and weight and lowering the price of a newly released device is definitely a new direction for Apple. The only time the iPad has ever increased in size from model to model was the iPad 3, and that was to accommodate the Retina Display feature. Apple going bigger and heavier in the service of lowering the price is definitely worth noting, especially in light of three years of falling iPad sales. This may disappoint some, but most of the potential buyers who care about such features will likely prefer a Pro model, anyway. In all honesty, there previously wasn’t enough separation between the Air 2 and the iPad Pro line beyond Pencil support. Now we see two distinct iPad lineups forming, which should make marketing them easier and hopefully less confusing for customers. I’m not quite sure what to make of Apple’s positioning of the Mini, and what it means for the future of this size iPad. While the outdated Mini 2 exited stage left, as expected, the Mini 4 remains. That wouldn’t be remarkable news on its own, but instead of just lowering the price of the existing 32 GB model to that of the new iPad, Apple did away with that model, made the only storage option 128 GB, and kept the price at $399. I guess this is a discount of sorts (the 32 GB model was previously $399), but it seems odd that a smaller form factor device would cost more than its new 9.7″ cousin. While the positioning of the iPad seems to clarify Apple’s product catalogue, this move makes a little less obvious sense to me. I’m sure there is a reason for this move. I’m just not sure what that reason is, yet. Going forward, it will be interesting to see if the on-again, off-again rumors of an iPad Mini Pro come to fruition after this shift in the Mini 4 specs and pricing. Apple already has two differernt iPad models at the 9.7″ size, so I don’t think this release is reason to write off a potential Mini Pro, just yet. Stay tuned. There had been some recent rumors of Apple getting involved in social media again, but thankfully reality is far better than rumor in this case. Rather than go back down the path of trying to create some kind of small-scale social network as they did with Ping and more recently, Connect, Apple will be releasing a video and photo editing and arrangement app called Clips sometime in the next month. Rather than attempt to re-create what makes Instagram, Snapchat, Facebook, and other social media and messaging platforms unique and popular, Apple is leveraging its on-device photos and video experience and library, and delivering an app that works with the services you already use. This is a smart move for Apple, as it is their best way to get involved in the creation of social media “stories,” without trying to beat established players at their own game. However, there will be some built-in advantages to sharing stories with others using one of Apple’s biggest lock-in features, iMessage. Apple struck a smart balance that plays to their strengths and minimizes weaknesses. Other things to note about Clips are the mid-cycle release of the app, which will hopefully be a continuing trend with Apple. We had the late release of Portrait Mode for the iPhone 7 Plus Camera last year and now this app. Hopefully these releases point to an Apple that is a little more iterative, and less dependent and locked into three or four defined event windows. I think it was also a savvy decision for Apple to release Clips as a stand-alone app, rather than try to shoehorn its features into either Camera or Photos. Both of those apps are simple and easy to use, which has always been a big selling point of the iOS experience. Apple has had issues coming up with the right balance of exposing new features without negatively impacting the interface in the now VERY crowded iMessage app. Many of the effects and App Store features that came in iOS 10 are difficult to find without instructions or guidance. By making Clips a free, but separate app and UI experience, Apple avoids the issue of its features either being buried and too hard to find for those who want them, or in the way for those who don’t. The iPad Pro lineup was conspicuously absent from yesterday’s proceedings. I think it is obvious that a new device like the 10.5″ model that is rumored would warrant its own Apple Event, even if it is smaller, or the stage is shared with new Mac releases. However, after seeing Apple’s online Store go down for updates, I was curious whether the rumored spec bumps for the 12.9″ and 9.7″ Pros might be released yesterday, as well. It is likely that these updated Pros won’t offer anything more exciting than the lower-cost iPad did in terms of changes. However, with all of the different devices and accessories that were released or upgraded yesterday, it is likely that Apple just decided to pair the 12.9 and 9.7 with the new Pro model to space things out a little bit and keep the marketing and product messaging separate. While a few media outlets chose to use yesterday’s modest release with little or no fanfare to make a statement about how boring tablets have become (I’m looking at you CNet and Fortune), I personally think that is overstating the issue a bit. With three of four more iPad Pro devices still to be announced, almost certainly at a staged event, I don’t think we can use a rollout of such modest upgrades to draw any sweeping conclusions. Even though iPad sales are obviously in decline at the moment, the fact that Apple will have at least five, and possibly six devices available after its upcoming event gives us ample proof that they are still committed to the platform. Apple’s aggressiveness and departure from their typical device marketing and design strategies with the lower-cost iPad also show me that they are listening to what the market is saying. Hopefully a combo of the iPad with new Pros will be enough to spur some upgrade sales and turn the tide back in the right direction. What do you guys think of the new iPad? At $329, is this a device that you would upgrade to from an older iPad? 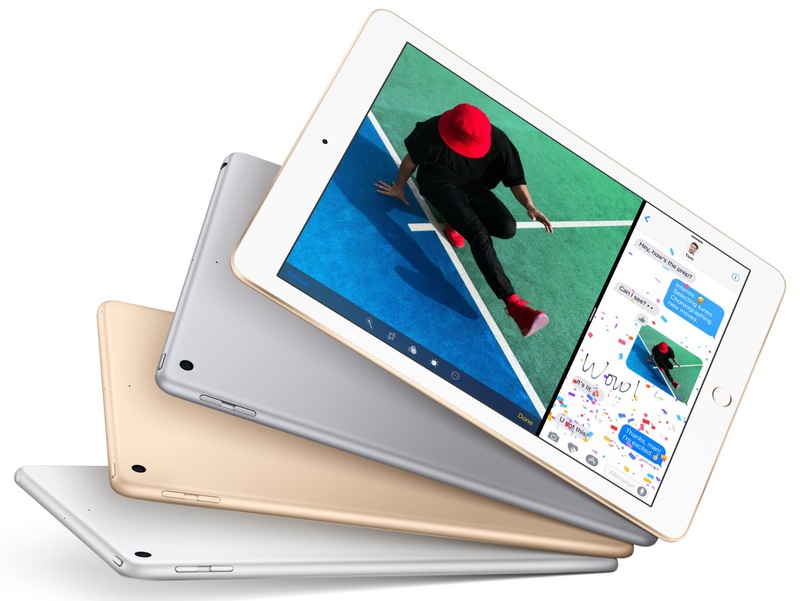 Are any iPad Air 2 users feeling let down by the new iPad’s trade-offs? How about the Mini 4 with 128 GB for $399? Is this enough to get you existing Mini users to pull the upgrade trigger? Is anyone out there excited about Clips? Let us know in the comments section below, on Flipboard, or @iPadInsightBlog. You can pry my Mini form factor from my cold, dead hands. I would never go back to the regular size, and you couldn’t pay me to use a Pro. Each one has its purpose, and even if the Mini is the mostly-forgotten step-child, I’ll still upgrade to a new version of it only when absolutely necessary. As purely a consumption device, it is the easiest to travel with, read at night with, watch movies with on the couch, and hold in my smallish hands overall. Should Apple abandon this, I’ll switch outside the ecosystem for the first time in 35 years. LOL. I appreciate a strong opinion! I was never advocating for the end of non-Pro devices. I just predicted it would happen initially. If you read the tech press and what they say and think about Apple, no one gives any attention to the Mini anymore. However, I had my eyes opened to how many people still use and prefer it thanks to comments from readers like yourself. I didn’t realize that, despite the growing size of the iPhone, the Mini still has a solid following. If you don’t mind me asking, do you currently have a Mini 4? If not, are you looking at upgrading to the refreshed model? Based on your comment, I get the impression that if Apple releases a Mini Pro, you won’t be swayed by it. If you are focused on media consumption, I can understand why the higher price tag of a Pro would be unnecessary and unattractive to you. Don’t get me wrong, I’m not a “mine is the only choice anyone should make” user! I’m thrilled Apple is offering so many choices to broaden the user base (and, frankly, keep up competition for the Surface, which I hear is really quite a fantastic machine). I have the Mini 3 (128 GB, wifi-only), purchased upon announcement back in fall 2014, to upgrade from an iPad 2 which was stolen at the gym (I was ticked off at the act, but not really from losing it). I haven’t noticed the Mini 3 suffering from any serious-enough slowdowns as the iOS and apps get more advanced. Far more storage than I need, so that is probably the max I’ll ever purchase in future iPads. On the other hand, my iPhone 6 (64 GB) is definitely showing its age in slowing down. For me, it boils down to at what point does it just become too slow to use – first world problems, amirite? Like my late 2014 iMac and Mac Mini, and new 13″ MBP with TouchBar, I far prefer to buy the machine(s) I know “fits” what I need to do (evidenced by not owning a Mac Pro), and maxing out the specs so that it lasts as long as possible, so it isn’t really about higher price tags but rather what suits my needs best. My late 2008 15″ MBP gave me 8 good years, and is actually still usable even with the latest OS (and an SSD upgrade and swapping the DVD for the original HDD), it just got too heavy and battery life too expensive to keep up. I expect the new MBP to give me another 6-8 years, the iMac and Mini hopefully will last a good 5 or so total, and the iPad Mini another year or so before I investigate upgrading. It’s also why my home office desk still sports my Apple //e and SE/20. I can use them if I want to (Lode Runner and Dark Castle, respectively), and they still start up faster than anything else I own. Consistently, however, I want to throw my iPhone 6 against a wall! Battery life has tanked severely, and it’s seemingly crumbling under the weight of processor speed requirements from apps and the iOS. I may jump on the yearly upgrade plan with whatever they come out with this year or next. Pardon all the background, but appreciate you reading! No apologies necessary. Mobile devices are a subjective thing. I have learned over the years that what works wonderfully for me may not be a good fit a all for someone else, and vice versa. That’s one of the reasons I love to hear from and chat with readers. It helps me keep a good perspective on what others are doing and remember that my way certainly isn’t the only way. I certainly didn’t take any offense. Like I said, I really do love a strong opinion. That makes for a lively discussion when everyone keeps it civil, which thankfully, most do around here. Also, background is a good thing. Thanks for sharing your experience. As for your comments on the iPhone 6, that device has had more issues than any other iPhone I can remember. It seems like a lot of the problems were corrected between the 6S and the 7, but there have been several problems that negatively affect the 6. I am actually on Apple’s iPhone Upgrade Plan. I switched away from AT&T’s Next because Apple offered AppleCare+ for just a few bucks more than I was paying. The drawback so far is that Apple makes you reserve a device and make the swap at an Apple Store. There is one where I live, but it is VERY difficult to reserve a spot with the model you want for launch day. I pulled it off this year, but had to settle for a Rose Gold 7 Plus instead of Gold (those pesky First World problems again). But, if I hadn’t gotten up at 2 AM and been ready as soon as the online store opened, I would have had to wait weeks. Once that happens, you then have to wait until your plan’s time is up based on when you got you last device. You could easily end up having to either wait a month or pay extra the way Apple does things right now. Hopefully they will change it up a little this year. My wife upgraded her 6 to the 7 (on the Apple upgrade plan), mostly for the better camera, and loves it. For me, having upgraded a 4 y/o Treo650 to the 3GS, then the 4S, to the 6, the form factor was the best size I’d ever used. The plus models may offer better specs, and I’d much prefer being able to use the phone horizontally (like the iPads), but I’ll take being able to physically hold the phone and have it fit in pockets than have a better unit. The 6 is still fine, it’s just that the battery is SO inconsistent, and even Apple has nothing to say about it when I brought it to the store. I can watch it be at 70% battery, put it down, pick it up a minute later, and it will be at 38%. I plug it in, and it shoots back up to 68% instantly. Or have it last at 1% for at least an hour before shutting down. And this is with draining the battery monthly. I’ve learned to keep it in reduced usage, and keep the brightness down. I just needs to last me until the next one, and I don’t need to be first in line to get it! I was disappointed to hear that the replacement for the iPad Air 2 will be heavier. I got my Air 2 because it’s easier for me to read on, but similar to a Mini in terms of weight. I am, however, interested in getting an iPad Pro, so I’m eagerly waiting for news about the possible 10.5″ version! (In looking into the Pro, I’m not sure whether I’d want a 9.7 or a 12) I love my Air 2, but it doesn’t support the Apple Pencil or Keyboard and I definitely want the Apple Pencil! Thanks again for posting the updates!